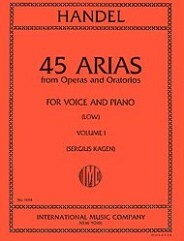 45 Arias from Operas and Oratorios – for Voice and Piano (Low) (Volume I). By George Frideric Handel. Edited by Sergius Kagen. 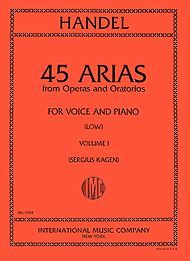 For low voice and piano accompaniment (low voice). Baroque. Difficulty: difficult. Collection. Vocal melody, lyrics, piano accompaniment, translations and introductory text. 63 pages. Published by International Music Company (1694). With vocal melody, lyrics, piano accompaniment, translations and introductory text. Baroque. 7.5×10.5 inches.